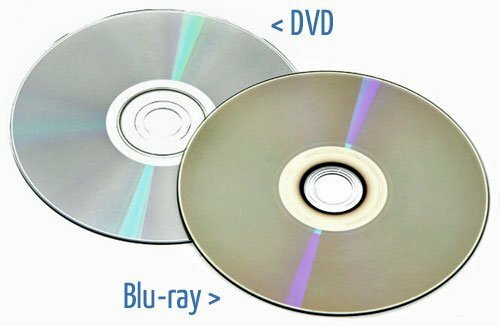 →What is the difference between Blu-ray and DVD? Although they have been on the market for quite some time, many people haven’t heard about Blu-ray discs while others don’t know the difference between them and ordinary DVDs. They are identical in size and shape and their differences lie in functionally, such as laser technology, player compatibility, storage capacity and resolution of the discs and players. This is true for both portable and the best portable bluray player. A DVD disc typically holds 480p, which is standard definition while other enhanced definition DVDs hold up to 580p. This works well on a standard TV screen but the picture would be blurred if displayed on a HDTV. The blu-ray disc on the other hand stores between 1080p HD and 2160p UHD data. This produces crystal clear display on HDTV screens, currently the best resolution available. Both disc player formats use laser to read and display the stored information but the difference is in the wavelength of the laser. The DVD player uses a red laser light with a wavelength of 650nm while the blu ray player uses a 405nm blue laser to read the stored data. The blue laser is also much smaller in diameter, thus information is much more closely decoded. Both types of discs are identical in shape and the bottom layer has grooves that provide a path for laser penetration. In a DVD, the larger wavelength red laser necessitates wider grooves for the beam to fit. This means that each layer of DVD has fewer grooves compared to bluray. That’s why a single layer DVD disc stores only 4.7 GB of standard definition data while a double layer DVD holds 8.7 GB of information. On the other hand, in a blu-ray disc, the shorter wavelength of the blue laser means that more grooves can be packed in a layer of the disc, thus storing more information. A single layer blue ray can store 25 GB data that equates to a 2 hour HD movie or a 13-hour standard definition film. A double layer blu-ray can hold 50 GB, twice the capacity and film length of a single layer blue ray disc. Due to the difference in laser lights used for decoding, you cannot play a blu-ray movie on a standard DVD player. The wide wavelength red laser in the DVD player cannot read the grooves of a blu-ray disc. However and luckily, all blue ray players do play DVDs, CDs and so on, and thus you don’t have to throw these formats away once you upgrade your disc player. However, the image quality will not be at par with blu ray film and some blu-ray players come with 4k upscaling technology to upscale the data from 480p to 1080p HD.